The inquiry that has culminated in this thesis was inspired by the challenges that many young Chinese people were facing when trying to gain access to affordable housing at the time of study, the early 2010s. By then, more than thirty years of housing reforms had completely changed how housing was being provided in China. The resulting structure had led young people to access housing in ways that were very different from those of their parents’ generation (Deng, Hoekstra & Elsinga, 2017). 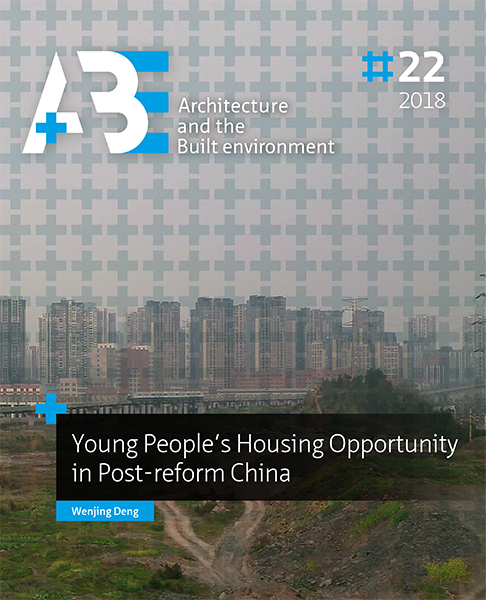 These observations prompted the following research question: What are the key factors defining young people’s opportunity to access housing, and how do these factors relate to China’s institutional changes during and after the market reform? The ensuing research has demonstrated that parental resources and intergenerational reciprocity are indispensable to the housing opportunity of young people, as home ownership has come to mediate the exchange of resources between generations. The marketization of the housing system , which dates back to 1978 and was ongoing at the time of study, was one of many institutional changes. In the housing domain, it entailed a drastic shift in tenure. The socialist system, which had been dominated by public renting (72% in 1978), was replaced by a system in which home ownership predominated (75% in 2011). That tenure shift could only be accomplished through reforms in other domains. Reforms in the fields of finance, land use, urban planning, and even in the Constitution created a ‘free market’ for developing and purchasing owner-occupied housing. In this study I have discerned four periods in China’s housing policy. These align with the main housing tenure(s) being provided: the welfare period (danwei public rental housing, 1949-1978); the dual period (subsidized and commercial home ownership, 1978-1998); the market period (commercial home ownership, 1999-2011); and the comprehensive period (commercial home ownership and public rental housing, after 2011). Each tenure has its own allocation procedures and particular criteria for deciding which applicants are most eligible and deserving. Thus, there were different mechanisms in each period for deciding which segment of the population would get better housing than the rest. Meanwhile, the structure of housing opportunity kept changing in the course of the reform. During the welfare period, people who were employed by powerful workunits and were loyal to the regime had better opportunities, since dwellings were allocated through a bureaucratic process that did not take the occupant’s income into account. During the market period, over 90% of the new housing provision was commercial home ownership. Therefore, I had expected the housing opportunities available to young Chinese people to show some attributes of a market economy: the higher one’s income, the better one’s housing. After the policy and literature review as the first step of my research, I introduced the market transition theory in the second step (Nee, 1989). I wanted to know whether housing opportunity in post-reform China actually did show the attributes of a market economy, measured by the significance of education, employment status, and income variables as predictors of home ownership ( Deng, Hoekstra & Elsinga, 2016). This hypothesis was tested on data from the Chinese General Social Survey 2010 with a logistic regression model. Some of the explanatory variables referred to the position of young people and their parents in the socialist redistributive system (such as membership of the Chinese Communist Party, work units, and hukou), while others were indicative of the young people’s economic capacity (education, employment status, and income). According to the statistical modeling exercise, young people’s economic capacity was an insignificant variable for predicting their opportunity to access homeownership. Instead, the exercise demonstrated the relevance of two redistributive variables: Communist Party membership of their parents; and locality (local or non-local) of the hukou (which was automatically inherited from one’s mother but could be changed). People often needed a local urban hukou to enjoy the welfare amenities provided by municipal governments. The farther away one’s hukou was registered (and thus the longer the distance migrated), the less likely one was to become a homeowner. Given the crucial parental role that came to light in the second step, I then investigated how parents influenced young people’s housing opportunity and why. For that third step I turned to the two theories of ‘trade-offs’ (Kemeny, 2001; Kemeny, 2005) in the organization of societal institutions (the one between homeownership and the welfare state, the other between the welfare state and intergenerational exchange). The goal was to explore how housing, welfare, family, and gender interact in a particular context, namely post-reform China. By interviewing young adults and senior parents in Chongqing, I sought to understand the experience, perception, and rationale of intergenerational transfer for home ownership. The empirical evidence suggested that when the provision of public welfare was limited, senior parents were motivated to help arrange adult children’s homeownership in exchange for support, specifically for care in old age. This interpretation was substantiated by the divergent patterns of perception and behavior regarding intergenerational transfer for home ownership that were found between parents with either an urban or a rural background. Consistent with China’s dual welfare system, senior parents who lived in the countryside or had a background of rural-urban migration were found to have less pension and fewer other benefits than urbanites. As a result, the non-urban parents tended to view intergenerational transfer for children’s homeownership as either their ‘responsibility’ or a strategy to secure support in old age. In contrast, urban parents tended to view it as an act of parental love; consequently, the return they expected was merely emotional. The young recipients tended to acknowledge the implications of reciprocity, so they took upon themselves the obligation to return the favor. The feeling of indebtedness and the commitment to reciprocate were stronger among those who had received help from their rural parents, whose transfer often involved all of their wealth. When rural seniors with no pension transferred all their savings to a child, they would subsequently move into the child’s household; the latter assumed the limitless obligation to support them. Conversely, when urban parents transferred all their savings to a child, the latter did not assume that limitless obligation, since the parents would have a pension income in the future. As intergenerational transfer was seen to play an important role in young people’s housing opportunity and in elderly people’s care strategy, a closely related variable came into view: gender. Before the socialist system of welfare and housing was developed, the provision and inheritance of residential property was linked to customs regarding elderly care and ancestor worship, so property transfers were likewise carried out patrilineally. Accordingly, the parents of the bridegroom were presumed to accept the responsibility to provide housing for the newlyweds, transferring the property rights inter vivos or as a bequest. Furthermore, the bride was presumed to become a member of the bridegroom’s family and thus to care for his parents until death. These patrilineal patterns were somewhat counterbalanced by the socialist regime, as the state predominated in allocating housing resources. But when the private owner-occupation housing market was established after the reform, an old custom was resurrected: parents stepping up to help young people acquire housing. But this custom affected young men differently than young women. In multi-child families, parents made the preparations and eventually transferred their assets to their sons prior to or at the moment of marriage but provided no help, or at best offered interest-free loans, to daughters upon request. In single-child families, parents would not prepare an asset transfer for their daughters. They expected their daughter’s future husband and his family to provide for her unless their daughter’s future marriage partner choice proved incapable of doing so and the daughter requested some help. In a sense, women were in a privileged position: they were able to access housing services through marriage. By the same token, however, they were disadvantaged: women did not have equal opportunity to hold housing property rights and to thereby accumulate housing assets. The position of the women I interviewed for my research was quite diverse. Some, like an urban single child with good earning power and an intergenerational transfer, had attained independent home ownership. Some women owned their home together with their husbands. And some, like those with a rural immigrant background, were living in a rental dwelling or in a home owned by the husband. The empirical evidence supports the hypothesis I formulated when starting my research: that home ownership, the welfare state, and family and gender relationships are interconnected. I used the concept of social coordination to capture the interaction of the housing, welfare, family, and gender systems. According to the social coordination framework, when the housing system of a society is dominated by home ownership, this society might have the features of a limited welfare state, could engage in extensive intergenerational transfer, and could show a clear gender division. This framework has contributed to the theorization of intergenerational transfer for home ownership. In that light, homeownership-based welfare (Doling & Ronald, 2010; Ronald & Elsinga, 2012; Elsinga & Hoekstra, 2015) can be understood from an intergenerational perspective. The social coordination framework is also a promising basis for further research on the relationship between housing systems and the wider social structure (Kemeny, 1992, 2001). What, then, were the structural features of housing opportunity for young Chinese people in post-reform China? Indeed, the development of a housing market and the massive supply of commercial housing gave some of them the opportunity to enjoy better housing conditions and even own property at an earlier stage of life compared to senior generations. However, by the second decade of the twenty-first century, their housing opportunity did not correspond to the status they had achieved in the market economy. One contribution of my research may be to bring a housing perspective into the debate about how the transition from state socialism to a market economy changes the structure of incentive opportunity. Unlike the kind of housing opportunity research that considers the whole urban population, research with a narrower focus -- on young adults from both urban and rural backgrounds during the 2010s -- suggests a much more limited effect of the market allocation of housing. Moreover, as I have pointed out, the current structure of housing opportunity was a result of the policy bias in favour of home ownership (Ronald, 2008). On that basis, I have argued that housing opportunity can be improved by adapting the current housing policy to develop a healthy rental market and by creating a tenure-neutral housing system in the future.